On November 29, 2018, the Illinois Supreme Court unanimously declared two recent changes in Public Act 97-651, impacting the calculations for some pension plans, to be unconstitutional.In Carmichael v Laborers’ & Retirement Board Employees’ Annuity & Benefit Fund of Chicago, the Court was forced to decide whether these recent amendments, which modified the calculation of annuities, violated the pension-protection Clause of the Illinois Constitution. In Carmichael,nine plan participants of three pension funds (the Laborers’ and Retirement Board Employees’ Annuity and Benefit Fund of Chicago (LABF), the Municipal Employees’ Annuity and Benefit Fund of Chicago (MEABF), and the Public School Teachers’ Pension and Retirement Fund of Chicago (CTPF)) brought suit alleging that modifications to how their pensions were managed were unconstitutional. The first modification in question eliminated a plan participant’s right to contribute to the fund and earn union service credit during a leave of absence from public service. Before the modification to Public Act 97-651, pension plan members were able to contribute to a fund and thereby receive credit for service to public service even while doing work for private unions while on leaves of absences from their public service job. The second modification amended the LABF and MEABF pension plans to hold that only a salary paid by a defined public employer could be used to calculate the highest average annual salary, which is in turn what the pension is based on. While this modification was explained to be a declaration of existing law, in truth, for decades funds had routinely used a participant’s higher private union salary earned while on a leave of absence from public service to calculate the highest average annual salary. The plaintiffs asserted that these modifications unconstitutionally diminished their retirement-system benefits by both taking away the benefit of earning service credit for public service for a union leave of absence and by taking away the possibility of using a private union salary to calculate the highest average annual salary. Further, they alleged the amendments violated the contracts and takings clause of both the Illinois and United States Constitutions. In this case, the Circuit Court first found that the right to earn union service credit was a retirement system benefit protected by the pension clause of the Illinois Constitution. They therefore found that this amendment violated the pension clause by taking away a retirement benefit that the legislature had previously granted. The circuit court initially found that the amendment which only allowed a salary paid by a public employer to calculate the highest average annual salary also violated Illinois’ pension clause. The court determined that this amendment was not a declaration of existing law, but that the legislature originally intended that the LABF and MEABF members could use union salaries from private employers, earned during a leave of absence from the public employer, to calculate pensions. However, the Circuit Court then changed its decision when asked to reconsider, and ultimately determined that the Pension Code did in fact limit the salary to be considered to be one paid only by public employers. This alteration of the law unconstitutionally diminished the plaintiffs’ retirement system benefits. Both the Plaintiffs and the State appealed the circuit courts decisions, which then went directly to the Illinois Supreme Court. The Supreme Court agreed with the Circuit Court that the right to earn service credit while on a leave of absence from a public employer in order to work for a local labor organization is a benefit described by the Pension Clause; they agreed that removing this right was a constitutional violation. In regard to the issue of calculation of highest average annual salary the Court focused on whether the amendment was a clarification of law or a substantive change. 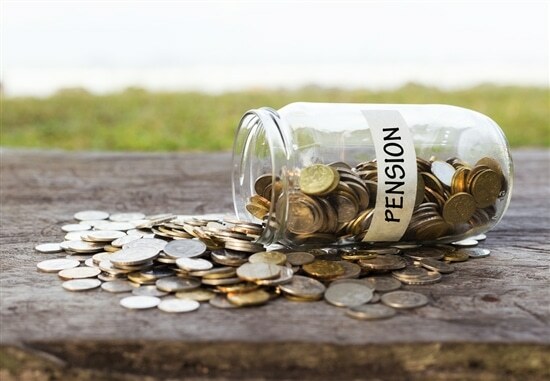 The Supreme Court found that the Pension Code did not clearly define the highest average annual salary per year to be used in pension calculations. to be ambiguous, as to the definition of highest average annual salary, prior to the amendments. The Court also explained that accepting the States approach could arguably create an absurd result. For example, a union member who retires while on a lengthy leave of absence from a public entity may not have sufficient years of salaries paid by the public entity to use in calculating their pension. Due to the ambiguity surrounding the language of the Pension Code and the potential for a member to lack an eligible salary off which to base their pension, the Supreme Court reversed the Circuit Court decision and held that individuals must be allowed to use a private union salary earned during a leave of absence to calculate the highest average annual salary. Further, the Court held that the amendment made a substantive change to the law which diminished plaintiffs’ retirement system benefits in violation of the pension-protection clause of the Illinois Constitution. For more information and help regarding legal matters, please contact Sherer Law Offices at (618) 692-6656.